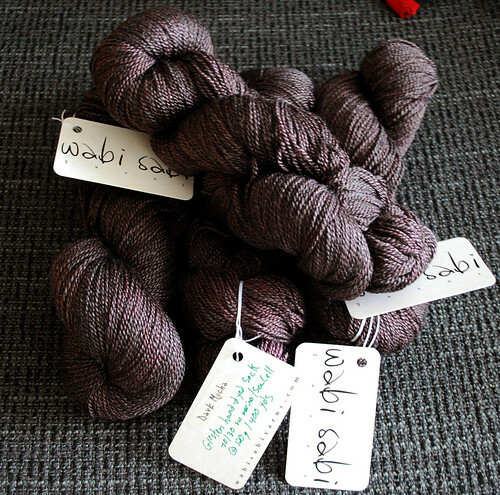 New Yarn: Wabi Sabi Yarns are here! January 13, 2010 Adri H.
It's here! The Wabi Sabi Yarn direct from yarn artisan Lisa in Boulder, Colorado (aka Wabi Sabi Yarns and/or Poppy Flower Fibers) has arrived. I'm so excited! The package arrived whilst I was barely awake, but now that I'm fully conscious I am totally appreciating these colors. Thank you, Lisa!!! "Jaded" is much more intense and richly colored in person than what is pictured. Somehow the camera just does not absorb the deep green tones. The color reminds me of ancient jungle temple ruins. I think my mom will love this! 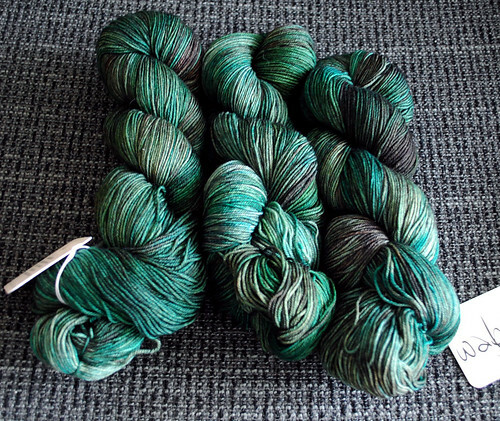 Absolutely beautiful yarn and color. I hope my knitting will do this yarn justice. "Dark Mocha" is a superwash merino & sea cell mix and it really does "glisten" as the yarn's description says it does. I have plans for this beautiful yarn... I think it will be a tunic of some kind, something like the "zickzack tunic" from Interweave Knits Spring '09.